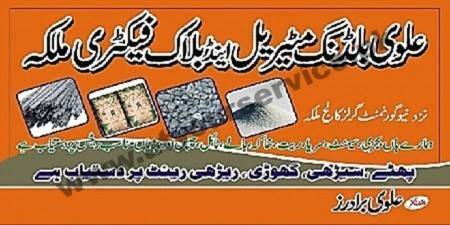 Alvi Building Material & Block Factory is located on Manglia Road, Malka, Gujrat. We offer all kind of building material such as cement, sarya (Iron Bars), stone crush (bajri), sand (rait), Bricks & blocks etc. We sell quality products at very economical and competitive price. Buy quality blocks manufactured at our factory. Special price when you order minimum 1000 Blocks.